1. 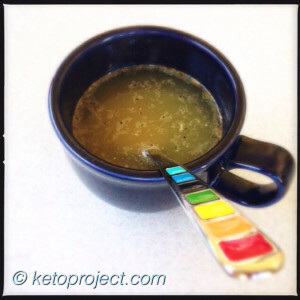 Pour broth into a microwave-safe mug or bowl. 3. Heat to desired temperature in the microwave. I heated mine on high for about 2 minutes. 1. Place lettuce and kelp noodles, if using, on a plate. 2. Top with oils, seasonings, and a pinch of feta cheese. 3. Add pork rinds and prosciutto to the plate. This entry was posted in Lunch and tagged atkins, induction, keto, low-carb, lunch, pork, salad, soup. Bookmark the permalink.